The foreign embassies in Nigeria are normally very busy from Monday through Friday with a lot of young Nigerians seeking visas to travel out to America, Europe and other parts of the world. Very often most of the intending travellers have no idea about what it entails to stay in foreign countries. The only thing they anticipate is the entry visa. Often as many cases have indicated, some of these travellers get stranded; some get involved in unlawful activities leading some to imprisonment, injury and even death. The underlying issue here is that most people do not understand the true nature and nurture of living overseas. It is not really as sweet and as beautiful as the streets lights, sky scrapers, cinemas, parks and shopping malls! Last Sunday’s gospel reading was focused on God’s radical call and the anticipated radical human response. In This Sunday’s gospel our Lord Jesus Christ goes further to give us the job description for those who have responded to the divine call as well as the entailment therein. From the gospel periscope we see clearly that it is one thing to answer the call and another thing to do the work in line with what is required to carry out such a radical mission (just as it is one thing to travel overseas and another thing to stay and survive there). These details would be explored later. Before launching into the mission description in the gospel, it will be pertinent to point out the repetition of words like JOY (REJOICE) AND PEACE in all the readings including the responsorial psalm and the alleluia verse. Joy and peace are well known to us as rare fruits of the Holy Spirit (Gal.5:22). They are rare because they cannot be obtained without connection with the Holy Spirit; surely they cannot be bought. We are invited to appreciate the fact that there is JOY in serving God (Nehemiah 8:10b) just as it brings true and lasting peace (Jn. 14:27; 20:21). The gospel reading (Luke 10:1-12.17-20) began by telling us that our Lord appointed seventy others and sent them ahead of him to the places he was about to go. The choice of seventy others is very much like in the case of Moses whom God asked to appoint seventy elders to assist him in his work (Numbers 11:16-17). These seventy were appointed by our Lord Jesus Christ to complement the work of the twelve whom he sent out earlier (Luke 9:1-6). This appointment tells us that the spreading of the good news of the kingdom of God goes beyond the twelve. In our context we could also say that it goes beyond the clergy. Hence all the baptized who share in the common priesthood of Christ are in various ways called to the mission of spreading the goods news by words and by deeds. In this regard the Catechism of the Catholic Church (no.897) maintained that: “all the faithful except those in Holy Orders and those who belong to a religious state approved by the Church. That is the faithful, who by Baptism are incorporated into Christ and integrated into the people of God, are made sharers in their particular way in the priestly, prophetic, and kingly office of Christ, and have their own part to play in the mission of the whole Christian people in the Church and in the World”. Those involved in this were sent out two by two. This arrangement is instructive. By going two by two they become company for each other and will be able to become two better heads in the work of evangelisation. No man is an Island even in the work of spreading the good news. In the early Church we see this playing out with the apostles. In Acts of the Apostles (3:1-10) we see the company of Peter and John. Also in Acts (13:2) the Holy Spirit advocated for the setting apart the company of Paul and Barnabas for the work they will do. Often most people think that they can do all the work by themselves unaided! (This is often motivated by the material returns). But our Lord Jesus Christ said the work is enormous and more labourers are needed and they have to work mutually like a community. There is also need to note that those on this mission are being sent out as labourers not as workers. Workers are more of professionals involved in skilled occupation; they make up the working class and receive stable big salaries. Labourers on the other hand are mostly unskilled people who do manual jobs and receive unstable salaries. Labourers simple minded are more committed in their duties. They are satisfied with just enough for the day! Being labourers without steady and enormous salaries they were asked to not to carry purses, bags, and sandals. This instruction couldn’t have been an easy one in that mountainous, dusty and often cold environment. The reason behind the instruction is to make those who are being sent to know that God is their provision (Phil.4:19) not just a provider (Gen.22:14). They are meant to depend entirely on God for the mission not on the material aids they could go with. This also suggests that they should travel light for the journey. Being loaded with bags and other things could become obstacles on the way. In addition they were asked not to salute anyone on the road. This may sound anti-social but the simple fact is that they are being discouraged from meddling with frivolities as they will still greet the people they will minister to in their houses not on the road. The road here stands for an arena of distraction; in fact distractions are more on the roads than anywhere! They were asked to undertake family evangelization going by the fact that they were asked to be going into various houses. We all know the conventional saying that charity begins at home so it also conversion and faith in God. We remember in the apostolic times most conversions were family based like in the case of Cornelius and his household (Acts 10:1-48). Here we see the family as the ideal ground for the fruition of the gospel message and for this reason the Church refers to the family as a domestic Church (LG. 11). Our Lord Jesus Christ told them to pronounce peace on any house they enter. The connection between peace and the good news cannot be over emphasized. Peace prepares the mind to listen and understand the message of the kingdom. This explains why our Lord Jesus Christ encountering the apostles in the upper room after his resurrection first wished them peace (John 20:19). Furthermore they were asked not to perambulate from one house to the other and to eat whatever that is set before them. Often people circulate from one place to the other in view of greener pasture or better livelihood. The job description given to these labourers of the good news included healing the sick and preaching about the nearness of God’s kingdom. This job description has so far being misappropriated and commercialized by many people. Today the message is more of miracles of abundance of wealth (even without work). Today the message is about the annihilation of all enemies even those who are in need to mercy and forgiveness. Only very few people are interested in conversion and repentance, just a handful are mindful of works of mercy to the poor and needy, justice, fairness and forgiveness. There is no gainsaying the fact that not all who hear the word of God will accept it. There could be rejection of the word of God at various quarters but this should not discourage those who are on this mission even our Lord Jesus Christ was rejected by his own people (Luke 4:14-21). In fact the rejection of the messenger and the message is often a confirmation of the fact that the word of God struck some hearts and caused disquiet in some people. Remember that the word of God is alive and active, sharper than a two edged sword (Heb.4:12). The return of those appointed and sent on the mission was triumphal. They were filled with joy because their work was fruitful; even demons were subject to them. Why was their work successful? Their work turned out to be successful simply because they followed the instructions that they were given. It is always very gainful to pay attention to instructions and follow them. If they had busied themselves with material provision and distracted themselves on the road the result could have been different and negative. One of the secrets of success in life is paying due attention to instructions. On the other hand one of the destructive elements of our time is inattention to instructions. 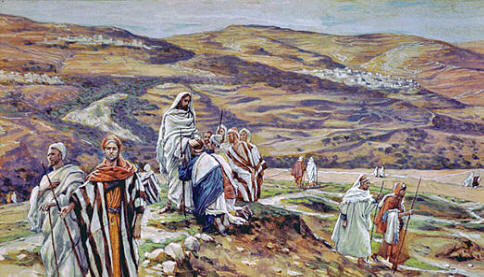 From the gospel reading we discover that those who went on this mission and paid attention to the instruction got more empowerment from our Lord when he said “I have given you authority to tread upon serpents and scorpions and over all the power of the enemy and nothing shall hurt you” (Luke 10:19). God will always upgrade us when we pay attention to him. The final purpose of the mission is not just to rejoice over the triumph over demons but on the fact that we are on course to heaven. It is possible to lead others to heaven and still not enter into it. On account of this our Lord Jesus Christ told the returnees from the mission to rejoice rather based on the fact that their names are written in heaven. We all have been called and appointed by our Lord Jesus Christ in many capacities to function as labourers in the plentiful harvest. You are on mission not only when you mount the pulpit but also your conduct in the pew, the things you say and do are missionary platforms. If we pay attention to the instructions of our Lord Jesus Christ concerning the nature and nurture of the mission to which we all have been called we shall not only be successful but our names will also be written in heaven. Have a blissful Sunday and a blessed week ahead!